When I first heard that they are making a Stephen Hawking biopic, the word that immediately comes to mind is, “Oscar bait”. A movie about a real-life scientist taking place in the mid-20th century? Surely it would not be easily confused with A Beautiful Mind (about mathematician John Nash), or The Imitation Game (about mathematician/computer scientist Alan Turing). 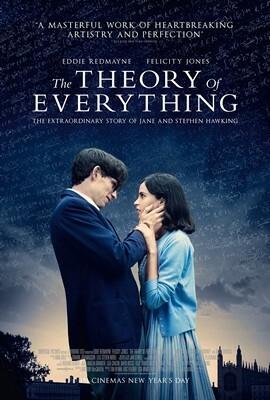 The Theory of Everything, in particular, is adapted from the book Travelling to Infinity: My Life with Stephen written by Jane Wilde who was played by Felicity Jones in the movie. It has been mentioned in many places that this is not a movie about physics, but rather a love story where one of the leads happens to be a physicist. I’d go even further to say that the lead character need not necessarily be a physicist at all. This is not to say that it was a bad movie. On the contrary it is actually a great movie about a person suffering from ALS and the impact it has on him and everyone close to him. It shows how this demands enormous strength and sacrifice from the people who are caring for him, and not in a hokey, naive-greeting-card-thank-you-for-your-sacrifice way but rather in a complex exploration that sometimes stray into morally grey areas. For the most part, putting physics far into the background doesn’t take anything away from the movie. However, whenever they suddenly lapse into an exposition about black holes it feels oddly out of place and the tone does not match the impact it presumably has on the story. For example, there was a scene of him getting a round of applause from a room full of physicists after he presents is new idea which is known today as `Hawking radiation’. Someone in the audience seem strangely offended by his theory, but on the whole the movie wants us to read this as a moment of triumph. But there was very little set up from previous scenes to show us why it was a triumph, or even the significance of his idea. The previous 30 or so minutes before this scene were mostly about his home life and how his wife Jane struggles to make their lives work. Nevertheless Eddie Redmayne puts in a great performance as Hawking. Other portrayals of historical figures where one has to learn the mannerisms and physicality one person in one physical state. Redmayne, on the other hand has to play a person whose body continuously transform throughout the movie. We see his body slowly wither through the years, with his speech getting slurred until he finally couldn’t talk or move any more. Towards the end he was mostly acting through his eyes. Felicity Jones as Jane Wilde also transforms in her own way. She starts out as a seemingly naive student at the beginning, falling for Hawking despite her friends laughing him off. Jones virtually carries the entire second half of the movie, as it is mostly told from her point of view. It is a natural transition since Hawking eventually gets confined to a wheelchair and is wholly dependent on her. At that stage of the movie we start to see her resolve being stretched thin as she struggles through an impossible role of having to take care of three children in addition to a disabled person. Jones’ character brought enough depth that we might even be sympathetic and understanding if she were to make any wrong choices along the way, especially with regards to her strained relationship with her husband. The movie does not pass any judgement either way. Sometimes, both Jane and Hawking’s motivations, as well as their actions, are intentionally left ambiguous, perhaps wisely so. Because frankly, we will never know some of the events that actually happened and it would be unfair to the real people if the movie decides to play a scene in any particular way. Other things that seemed oddly out of place are the discussions of religion and science. Jane is shown to be a devout Christian and at several points disagrees with Hawking–who appears to be an atheist–about the existence of a creator. It’s odd because their individual philosophies does not seem to inform any other aspects of their characters. Jane seems marginally disappointed that Hawking does not believe in God, though for most of their lives both of them seems ambivalent about it. In the film it was heavily implied that Hawking, in his discovery of Hawking radiation, disproves his earlier work about the initial singularity of the universe. In real life, that statement makes no sense since those are his two contributions to separate lines of research. Sure, a biopic is under no obligations of technical accuracy but it just seem strange because it serves no purpose at all to the story. One scene, however, looks like it was about to tie this into one of their discussions about religion but another conflict was abruptly thrown into the mix and we promptly forgot about it. The Theory of Everything, in essence, is a wonderful movie about coping with ALS. The physics aspects of it are pushed far into the background and what little of it that comes through seems like an abrupt change of tone. I wouldn’t have minded at all if it were absent altogether. In any case the centre stage here is the relationship between Stephen and Jane and the rocky life the build together while coping with the condition. It could perhaps further raise public awareness of ALS without having to pour a bucket of ice over your head. Schmoes Know: Two reviewers gave it 4.1/5 and 3.8/5. The Mary Sue: The Theory of Everything isn’t a film you watch out of obligation. It’s a movie you’ll want to watch, maybe even more than once.